Yesterday, April 2nd, was the birthday of Hans Christian Andersen, creator of such memorable stories as The Ugly Duckling, The Little Mermaid, The Little Match Girl, and The Emperor's New Clothes (among sooo many others). 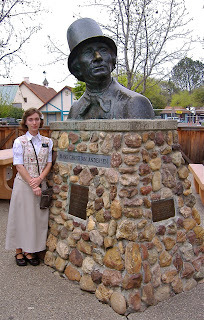 While serving a mission in California for The Church of Jesus Christ of Latter-day Saints, I was able to visit Solvang, a little Danish town that is the home of the Hans Christian Andersen Museum. It was a fun trip filled with eblskivers, marzipan (yum! ), and references to and information behind Andersen's stories. Born in 1802 in Odense, Denmark with disputed lineage, part of Andersen's education was paid for by King Frederick VI. Andersen was poor though and worked as an apprentice weaver, then later as a tailor. At 14 he worked as a soprano singer in Copenhagen for the Royal Danish Theater, then had to quit when his voice changed (dang puberty!). All was not at a loss though, because a friend told Andersen that he was a good poet. Andersen began to focus on writing. He then attended two more schools, later describing the experiences as the "darkest and most bitter of his life". He was awkward from being older than most other students, considered unattractive, had dyslexia, and was abused by one of his schoolmasters. Apparently the school people also told him that he should not pursue writing. He became depressed (what awful people! I'm so glad that he didn't heed them for long). He had much experience with unrequited love (not only with women, I just discovered). One love was the singer Jenny Lind upon whom he based his story, The Nightingale. Andersen eventually died in 1875 from injuries obtained from a nasty tumble out of bed several years earlier. 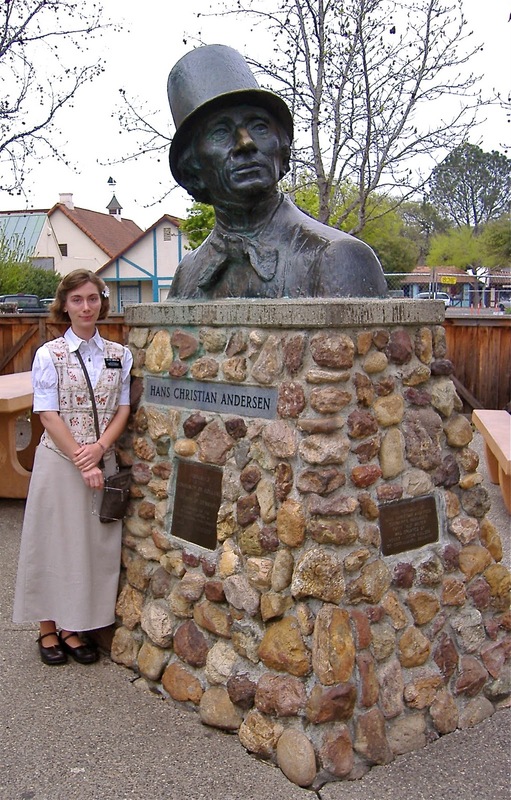 Concerning his impending funeral, Andersen requested certain music to be played saying, "Most of the people who will walk after me will be children, so make the beat keep time with little steps." Hans Christian Andersen's stories have been published and adapted in so many versions and media all over the world (we just watched Disney's Tangled, that contains a pub called, "The Snugly Duckling"). 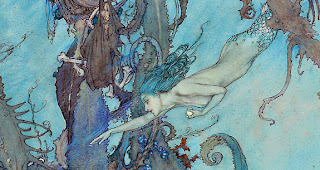 One of his stories that I have always loved (well, I love them all really) is The Little Mermaid (NOT Disney). It is beautiful; at one point forlorn, at another, full of hope, and even speaks of eternity in reference to love and the afterlife. "...if a man were to love you so that you should be more to him than father or mother, if he should cling to you with his every thought and with all his love, and let the priest lay his right hand in yours with a promise of faithfulness here and in all eternity, then his soul would be given to your body, and you would receive a share of the happiness of mankind. He would give a soul to you and yet retain his own." Mermaids do not have tears and do not have souls. They live long lives, but when their lives are over, they simply cease to exist. Because they have no souls, they cannot go to God. 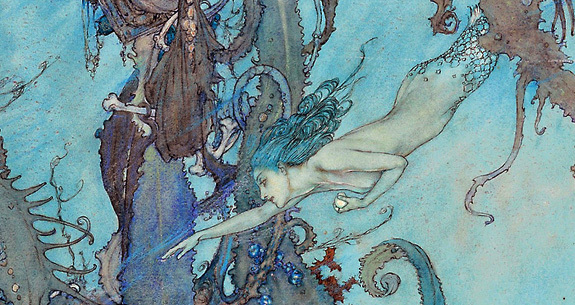 This original story of The Little Mermaid does not end with her marriage to the prince. It does not necessarily end with her death either. It ends with her transformation into a being who will eventually make her way to heaven and to God (is that not beautiful?). Hans Christian Andersen's other stories likewise have a richness and depth that can be hard to come by these days. They were written for the purpose of telling the reader something, they were not meant to simply be pretty stories. They were windows into Andersen's life and into the ways he wished his life could be.